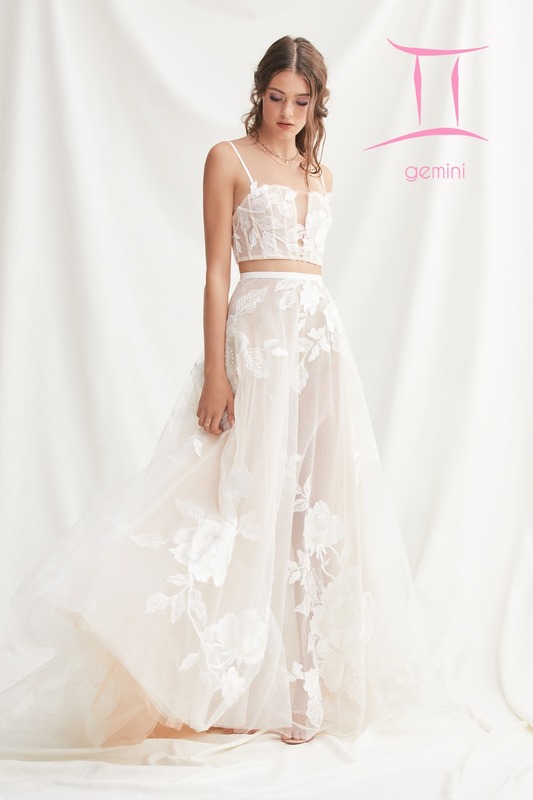 Are you in search of a new way to find the perfect wedding dress? have you thought about consulting the stars? … or at least the stars that you were born under? 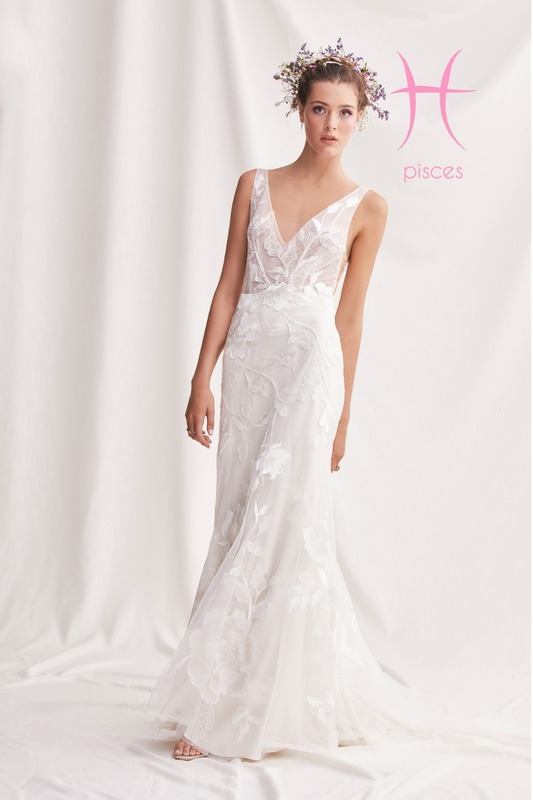 Willowby Watters has done a bit of the legwork for you and picked a fabulous gown from their New York Bridal Fashion Week show that would perfectly match your zodiac sign. So take a look and see what you think, and don’t forget to check out the full gallery to see the whole Willowby Watters collection! Aries is the first sign of the zodiac, and that's pretty much how those born under this sign see themselves: first. Aries are the leaders of the pack, first in line to get things going. The “Espinosa” gown is perfect for confident brides with a bold, plunging neckline and figure-flattering silhouette. The typical Taurus personality loves the rewards of the game. Think physical pleasures and material goods, for those born under this sign revel in delicious excess. This zodiac sign is also tactile, enjoying a tender, even sensual, touch. For the grounded and romantic bride-to-be, an all-over lace gown like “Dylan” is a beautiful option. Expressive and quick-witted, Gemini represents two different personalities in one and you will never be sure which one you will face. They are sociable, communicative and ready for fun, with a tendency to suddenly get serious, thoughtful and restless. Cancer, the fourth sign of the zodiac, is all about home. Those born under this horoscope sign are 'roots' kinds of people, and take great pleasure in the comforts of home and family. Cancers are maternal, domestic and love to nurture others. 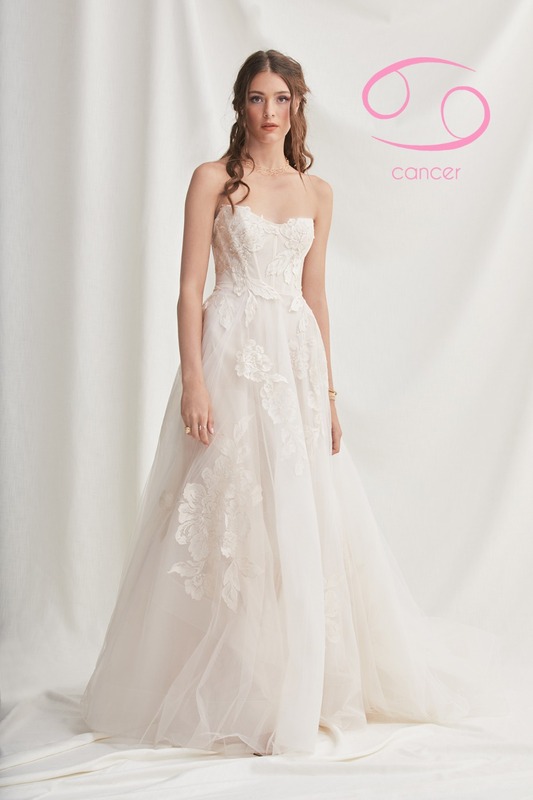 A style that’s both feminine and ethereal, “Harmony” is a lovely option for Cancer brides. Leo women are very warm-hearted and driven by the desire to be loved and admired, and as all people born under the Leo zodiac sign, love to be in the limelight. Virgos are always paying attention to the smallest details and their deep sense of humanity makes them one of the most careful signs of the zodiac. 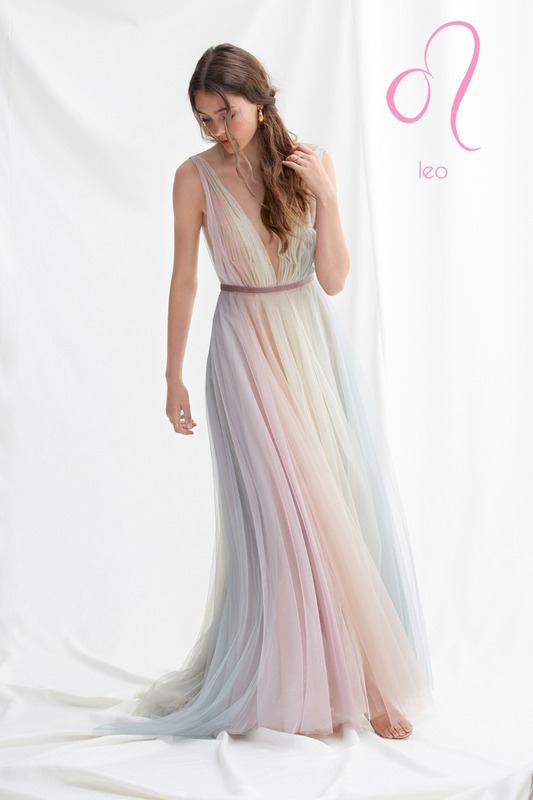 “Lennon” is the perfect gown to channel an earthy Virgo’s inner flower child. Libra are peaceful, fair, and they hate being alone. Partnership is very important for them, as their mirror and someone giving them the ability to be the mirror themselves. These individuals are fascinated by balance and symmetry, they are in a constant chase for justice and equality. The Scorpio zodiac sign concerns itself with beginnings and endings, and is unafraid of either. They also travel in a world that is black and white and has little use for gray. Curious and energetic, Sagittarius is one of the biggest travelers among all zodiac signs. Their open mind and philosophical view motivates them to wander around the world in search of the meaning of life. Fueled by wanderlust, “Arlo” is perfect for the free-spirited and adventurous bride. Capricorn is a sign that represents time and responsibility, and its representatives are traditional and often very serious by nature. These individuals possess an inner state of independence that enables significant progress both in their personal and professional lives. This dress was made for caps. 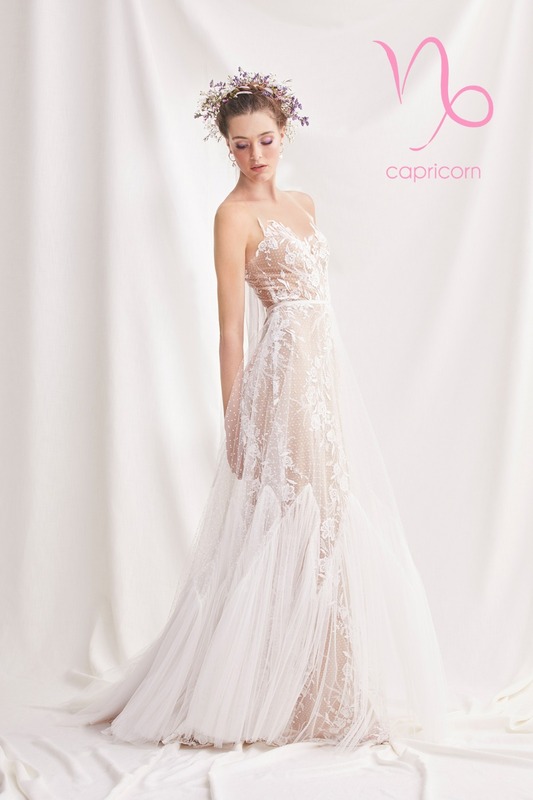 Named “Capricorn" it’s modern and timeless design is perfection. Those of the Aquarius zodiac sign are humanitarian, philanthropic, and keenly interested in making the world a better place. Along those lines, they’d like to make the world work better, which is why they focus much of their energy on our social institutions and how they work (or don’t work). 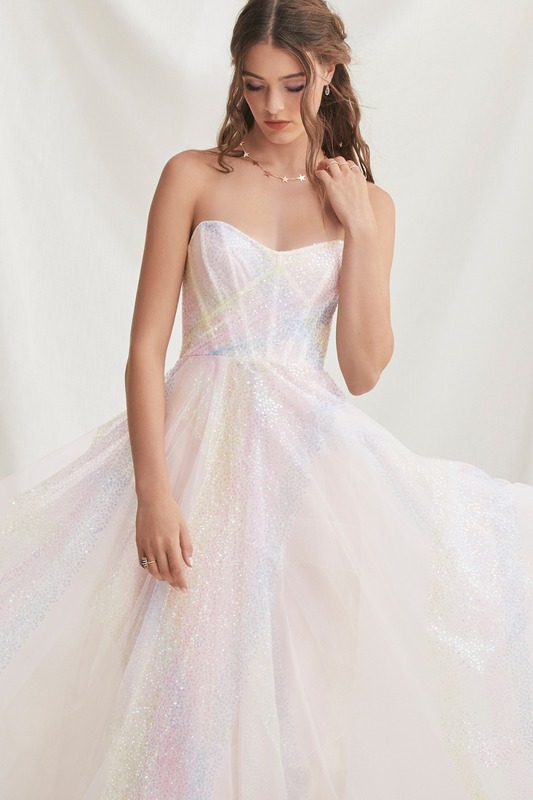 For the Aquarian bride-to-be that isn’t afraid to stand-out, the “Aquarius” rainbow dress is both dreamy and unexpected. Pisces are selfless, they are always willing to help others, without hoping to get anything back. Pisces is a Water sign and as such this zodiac sign is characterized by empathy and expressed emotional capacity. All hopeless romantics would fall in love with the dreamy and refined aesthetics of the “Honor” dress.